Background info on DPU pipeline hearings coming up: do your homework, and save the date! Here is some great info about the pipelines and DPU from our friends at North Quabbin Pipeline Action North Quabbin Pipeline Action and NoFrackedGasinMass. Please find links to downloadable, printable documents at the bottom of this page. Who are the Players for this Round in early 2016? MA DPU — The mission of DPU in part states: The Department is responsible for oversight of investor-owned electric power, natural gas, and water utilities in the Commonwealth…. The Department is to ensure that utility consumers are provided with the most reliable service at the lowest possible cost; to protect the public safety from transportation and gas pipeline related accidents; to oversee the energy facilities siting process; and to ensure that residential ratepayers’ rights are protected. The DPU has a staff of hearing officers working in this state agency under the Executive Office of Energy and Environmental Affairs headed by Sec. Matthew Beaton. The appointed Commission of three members makes the final decisions on petitions after public hearings are held. Anyone who does not wish to speak at hearings may just submit written comments. Those who choose to do both do not have to have those statements match. Since speakers are only allowed several minutes, it’s best to make clear, impactful spoken statements, and leave longer, more detailed statement for written submission – those may be as long as you’d like them to be. Tennessee Gas Pipeline/NED Project — The proposed Kinder Morgan/TGP Northeast Energy Direct (NED) is a 30” high pressure gas transmission pipeline. Tennessee Gas in their FERC Certificate Application Filing on Nov. 20, 2015 presented Resource Reports to FERC. Their proposed route enters Massachusetts in Hancock and follows a path from Hancock to Northfield, MA, affecting eight towns in Franklin County, before entering Southern New Hampshire. It then descends back into Massachusetts near Dracut and spreads out over several smaller lateral pipelines affecting many more communities in the east. There is also a lateral arm to the system that enters Massachusetts at Townsend. In January, 2016 Tennessee Gas petitioned the MA DPU asking permission to survey over 400 parcels of land that are on the proposed route in Massachusetts. National Grid – National Grid is an international electric and gas company based in England and the northeastern US. According to their website, National Grid “connects more than seven million gas and electric customers to vital energy sources.” National Grid delivers electricity to approximately 3.4 million customers in Massachusetts, New York and Rhode Island. The electricity industry connects generation sources to homes and businesses via transmission and distribution networks. Electricity is sold to consumers by companies such as National Grid who have bought it from the generating plants. Why is Understanding the Links between the MA DPU, Tennessee Gas/NED Project and National Grid Important? Tennessee Gas Pipeline /NED and National Grid filed petitions with the MA Department of Public Utilities (DPU) in January, 2016. The DPU must hold public hearings and accept written comments from citizens before the DPU Commissioners rule on the petitions. If the DPU takes months to issue their findings this delays things. If the DPU does not rule in favor of the petitions then this slows the process even more. So it is important to attend public hearings and take other action (see www.nofrackedgasinmass.org/dpu-issues-and-actions). The “Survey” Petitions to the MA DPU – What Are They? Tennessee Gas Pipeline/NED Petitions (#16-01/02/03) to the MA DPU — These petitions want MA DPU to grant approval of their request to survey over 400 privately owned land parcels which are on the proposed gas pipeline route for the Northeast Energy Direct (NED) project. With less than 50% of their on the ground surveys complete, TGP needs access to survey more land to support their FERC application. Tennessee Gas must perform civil, archeological, cultural, wetlands, waterbody and endangered/rare species surveys as well as geotechnical surveys on some parcels. If granted, TGP would be allowed onto land against landowners’ wishes to conduct surveys. This includes allowing them to cut any trees, shrubs or branches under 2” in diameter to clear a line of sight, and to drill small bore holes for geotechnical surveys where needed. Stop the Pipeline Response — This project is not needed which means that the DPU should not be involved and should not grant Tennessee Gas (TGP) the right to survey without the landowner’s permission. Public Hearings on these petitions will be held at six locations across the state. The hearings in Western MA include: March 29th in Pittsfield and March 30th in Greenfield at 7:00 p.m. For a full schedule of hearings see www.nofrackedgasinmass.org/dpu-issues-and-actions. Anyone may submit written testimony by May 6, 2016. National Grid Petitions (#16-07/05) to the MA DPU – National Grid’s petition to the MA DPU lays out their proposed plans for a tariff and a transportation capacity contract with the Tennessee Gas Pipeline/NED project which they want DPU to act on by October, 2016. Tariff – “Capacity Cost Recovery Provision Tariff” — National Grid is proposing to put in place a tariff to recover costs of getting gas capacity from Tennessee Gas. This includes costs concerning transportation contract, cost of a capacity manager, administrative costs and an Innovation Incentive (“equal to 2.75% of total fixed contract payments” for NG – p. 7 of Ann Leary’s written testimony). This tariff would be figured as a cost per KwH used by all customers and put on distribution side of bill if approved. Proposed National Grid Transportation Capacity Contract with Tennessee Gas — National Grid argues that their petition asking approval of a firm transportation capacity contract is consistent with DPU rulings (DPU 15-37 – 2015) and that “new natural gas delivery capacity may be added to the New England Market, including actions to be taken by the electric distribution companies” (p. 8 in petition). National Grid wants the DPU to approve a 20 year transportation capacity contract with NED and to also approve a plan for the “release of capacity available” via NED and “release of capacity and sale of LNG supply available through Access Northeast (ANE – #16-05).” They consider this innovative so in their thinking it qualifies for an incentive which is part of a tariff to be paid by ratepayers. If National Grid gets approval from DPU then it would also need approval from FERC and could release its capacity to the electric market. It appears that their plan is to have capacity to get gas and sell to electric generating plants during the times of the year when they say there is a shortage of gas for generating plants (maybe 20-30 days in winter). No Need for this National Grid Plan – This plan is not innovative and does not warrant a tariff to be paid by rate-payers. The plan seems to set up National Grid as the seller of gas to generating plants and then the buyers of electricity from these same plants and thus create a conflict of interest. Bringing more gas into the state for generating plants, which already use about 40-45% natural gas for electricity generation, means more of an imbalance. This means that Massachusetts moves farther from a diverse energy system and suppresses the move toward more renewable energy use..
equal consideration to comments made at a public comment hearing. Written comments may be submitted through Friday May 6, 2016.
and Hearing Officer Stephen August at Stephen.August@state.ma.us. Join with others and Attend Hearings – Speak or Write a Comment to Send to DPU. Watch for Information on rally activities at hearings. ++ Tell officials that you object to the DPU allowing Kinder Morgan/Tennessee Gas Pipeline (NED) project to survey on land where people denied access. ++ Tell the Governor and elected officials that you object to the tariff that National Grid wants the DPU to approve for their transportation capacity contract. 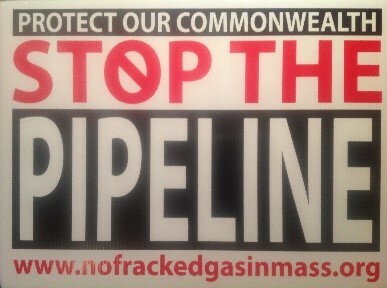 See www.nofrackedgasinmass.org for contact information, talking points and other actions. Become informed about the petition filings with DPU on issues that could help move the proposed Kinder Morgan/TGP NED pipeline project forward for approval by FERC. Write letters to the editor. Talk with your friends and neighbors. Join with Stop the Pipeline groups to work on stopping the unneeded project. Also contact officials asking for good legislation in the state including support for more renewables, conservation, efficiency, lifting the cap on solar projects, and supporting a better energy policy. Distributed by No. Quabbin Pipeline Action (www.northquabbinenergy.org/wordpress) with assistance from NoFrackedGasinMass (www.nofrackedgasinmass.org).